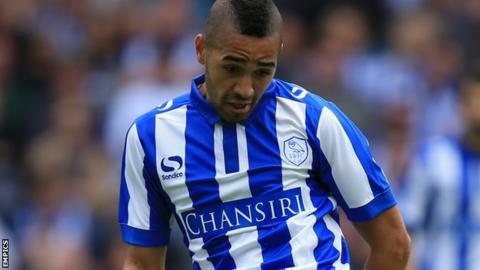 Sheffield Wednesday moved to within three points of the play-off places with a comfortable win over Preston. The hosts took the lead just before the break when Kieran Lee stroked home Fernando Forestieri's lay off. Daniel Pudil doubled the Owls' lead from close range before Preston's Alan Browne touched home Eoin Doyle's flick. Lewis McGugan secured all three points with a long range strike in injury time after Lilywhites goalkeeper Jordan Pickford had gone forward for a corner. Carlos Carvahal's side have now won their last four games in all competitions, while Preston have not won in eight matches after their promotion last season. After a first half of few chances, Wednesday produced a well worked passing move to eventually allow Lee to score on his 100th appearance for the club. On-loan Watford winger Pudil nicked the ball off John Welsh before finishing smartly for their second, but Browne's smart finish gave the visitors some hope. Adam Reach and Doyle went close grabbing an equaliser for Preston, but McGugan's strike into a free net eventually settled the game. "This is the Championship, the teams all the time believe they can change the score. "It's most important that we win, we are in a sequence of a lot of games. It was a typical game from the Championship. We won and we have three points and that is the most important thing. "The first goal was very important to us, at the break we were planning to try and correct everything. "Everything belongs to the players, we have a fantastic group." "It's a feeling of frustration, in the first half we were comfortable but we were the architects of our own downfall with all three goals. "Up to the 44th minute we were comfortable, I have never known Hillsborough so quiet, our goalkeeper has not had a save to make, then we make a mistake and we made another one after half-time and we have a mountain to climb. "We should have got something out of the game, we had Sheffield Wednesday on the back foot and had some really good opportunities to get something out of the game. "But at Championship level you get punished if you make mistakes." Match ends, Sheffield Wednesday 3, Preston North End 1. Second Half ends, Sheffield Wednesday 3, Preston North End 1. Goal! Sheffield Wednesday 3, Preston North End 1. Lewis McGugan (Sheffield Wednesday) right footed shot from more than 35 yards to the high centre of the goal. Assisted by Álex López. Corner, Preston North End. Conceded by Michael Turner. Attempt saved. Álex López (Sheffield Wednesday) left footed shot from the left side of the box is saved in the centre of the goal. Substitution, Sheffield Wednesday. Álex López replaces Fernando Forestieri. Attempt missed. Lewis McGugan (Sheffield Wednesday) right footed shot from outside the box is close, but misses to the right from a direct free kick. Kieran Lee (Sheffield Wednesday) wins a free kick in the attacking half. Attempt missed. Eoin Doyle (Preston North End) right footed shot from outside the box is too high. Assisted by Daniel Johnson. Attempt blocked. Adam Reach (Preston North End) right footed shot from the centre of the box is blocked. Assisted by Daniel Johnson with a cross. Corner, Preston North End. Conceded by Jack Hunt. Attempt saved. John Welsh (Preston North End) right footed shot from outside the box is saved in the top centre of the goal. Goal! Sheffield Wednesday 2, Preston North End 1. Alan Browne (Preston North End) left footed shot from the centre of the box to the bottom left corner. Assisted by Eoin Doyle with a headed pass following a corner. Corner, Preston North End. Conceded by Sam Hutchinson. Attempt missed. Greg Cunningham (Preston North End) header from the centre of the box is high and wide to the left. Assisted by Adam Reach with a cross. Attempt saved. Greg Cunningham (Preston North End) header from the centre of the box is saved in the top centre of the goal. Assisted by Chris Humphrey. Offside, Preston North End. Greg Cunningham tries a through ball, but Eoin Doyle is caught offside. Substitution, Sheffield Wednesday. Lewis McGugan replaces Ross Wallace. Attempt missed. Eoin Doyle (Preston North End) header from the centre of the box misses to the right. Assisted by Adam Reach with a cross. Attempt missed. Jordan Hugill (Preston North End) header from the centre of the box is too high. Assisted by Greg Cunningham with a cross. Attempt missed. Alan Browne (Preston North End) header from the centre of the box misses to the right. Assisted by Daniel Johnson with a cross following a corner. Corner, Preston North End. Conceded by Kieran Lee.